There are many events coming up for everyone to be involved. To get involved with these events contact TRO President Paul Young - KE5EHM on one of our repeaters or by email at KE5EHM@tulsahamradio.org or telephone 918.637.8414. Please use the repeaters supported by your club! For more information about the Seminar, click here. A great public relations opportunity for ham radio and the TRO. Contact: TRO President Paul Young - KE5EHM by email at KE5EHM@tulsahamradio.org or telephone 918.271.1435 for more information or to volunteer. The TRO will be hosting a table during the Green Country Hamfest. The TRO table will need to be manned from 4 P.M. to 9 P.M. on Friday and 8 A.M. to 3 P.M. Saturday. If you could help at the table an hour or two contact Doug Lee - KC5ZQM by email at KC5ZQM@tulsahamradio.org or telephone 918.510.2396. For more information about the hamfest, click here. Chisholm Trail South Park 4000 E New Orleans in Broken Arrow - ham radio demonstration. What you learn could save a life! Emergency respond agencies. If would like to assist contact Doug Lee - KC5ZQM by email at KC5ZQM@tulsahamradio.org or telephone him at 918.510.2396. The Copland Classic event requires only 4 volunteers, a net control and 3 SAG's. This year we already have Ben Joplin - WB5VST for the net control station and 2 people for SAG's so far. Need at least 1 more before May 18th. If you would like to assist contact Paul Young - KE5EHM by email at KE5EHM@tulsahamrdaio.org or telephone hm at 918.637.8414. The TRO will provide communications support for the Maple Ridge Run. The runs begin at 0800 and are usually concluded by or before 1200. Communications volunteers need to arrive at 0700. You can't be late or the streets will be blocked. 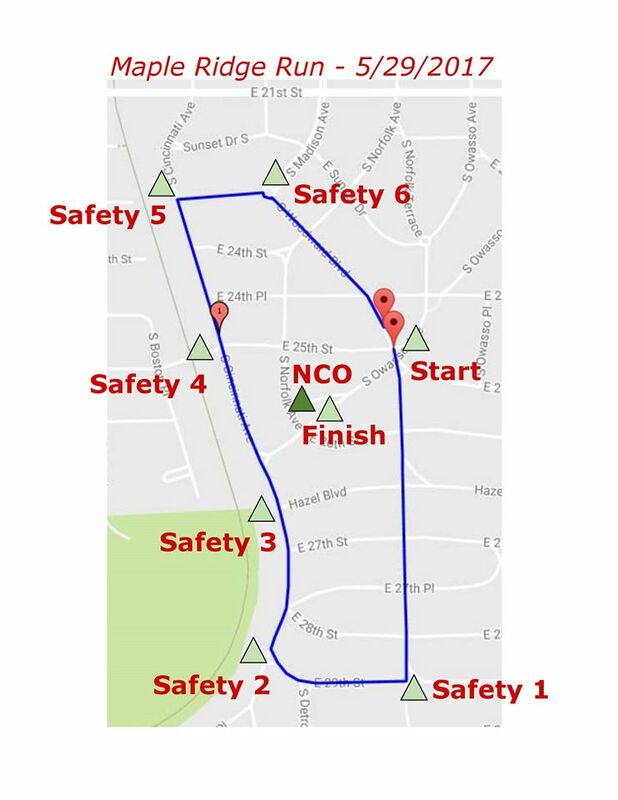 We will gather starting at 7am near the start line at 26th and Owasso, look for the yellow Nissan Xterra with amber flashing lights. Safety Briefing will be no later than 730am. Please have the 146.88 repeater programmed for your radio. Would be ideal to have all three PL tones ready. We'll use 146.55 simplex as backup. Assignments will be made as volunteers arrive and check in at the radio command post. The command post will be at my vehicle (look for the yellow Nissan Xterra with amber flashing lights). 10 or 11 operators are needed. Mostly handy talkies for communications. Volunteer for some fun, communications practice and some ham fellowship. To volunteer contact Paul Young - KE5EHM by email at KE5EHM@tulsahamradio.org or telephone 918.637.8414 for more information. The TRO will provide communications support for the Tour de Cure bicycle ride. What time? Arrive at/before 0700 to help things move quickly and smoothly for all. Water? Bottled water and jugs of Gatorade and water available on the route. Feel free to grab some bottles to take with you for cyclists along the route. Medical? There will be first aid stations at each rest stop and of course, at the start/finish. More procedures available on day of event. Weather? Rain or shine the event goes on! -- More procedures available on day of event. TShirts? Fill out the quick poll on the Facebook event page to help us get you the right sizes ahead of time. Otherwise, we can true up after the event. Route maps? Feel free to bring your own, use the ones we provide on the morning of the event. Assignments? I'm looking for one stationary and as many mobile units as we can muster. I'll dole those out the morning of the event as folks arrive. Gas? Fill up Saturday before you arrive to check in. Fill up once we clear you from the course. Give me that second receipt with your name, address, callsign and phone number. We'll get a check in the mail to you. Tools/Equipment? Bring a bike rack if you have one. We'll have bike shops on the route to fix the broken things. You are welcome to bring tools to allow a cyclist to fix their own bikes - but we are NOT being asked to perform any repairs. Volunteer for some fun, communications practice and ham fellowship. Contact: TRO President - Paul Young - KE5EHM by email at KE5EHM@tulsahamradio.org or telephone 918.637.8414 for more information. The Tulsa Repeater Organization welcomes you to the Field Day site. The TRO will have the 2019 Field Day at the (Not decided yet). When: We will begin set up for Field Day between 0800 and 0900 CDT Saturday morning. We will operate two Field Day stations until 1800 hours CDT then tear down and go home. Pizza Dinner around 5:00 or 6:00 PM. Bring your own drinks! We'll have water. Contest begins Saturday, June 22nd 1800 UTC (1300 CDT) thru Sunday, June 23rd 1800 UTC (1300 CDT). The TRO Field Day will be only on Saturday until around 1800. Field Day is an annual amateur radio exercise, sponsored by the ARRL, encouraging emergency communications preparedness among amateur radio operators. In the United States, it is typically the largest single emergency preparedness exercise in the country, with over 30,000 operators participating each year. Dam J.A.M. September 7, 2019. Please try to help them out if you can. Provide communications between checkpoints of the bicycle tour over a large part of Northeastern Oklahoma. We will also be asking Mayes County Amateur Radio Club, Rogers County Amateur Radio Club and Amateur Radio Emergency Services for volunteers for this event . Click here for more detail information about the Dam J.A.M. The Cystic Fibrosis Foundation in Tulsa has requested ham radio assistance for a bike ride on Friday September 13th at 1730. Contact: TRO President Paul Young - KE5EHM by email at KE5EHM@tulsahamradio.org or telephone 918.637.8414 for more information. Plans for the 2019 party are not made yet. . . . . . . . . . . . . . . . . . . . . . . . . . . . . . . . . . The party of 2018 was held at Shiloh's Restaurant at 2604 North Aspen in Broken Arrow. The 2018 party: a dirty santa game that the gifts consists of ham radio equipment you wish to get rid of. Bring something from your junk box wrapped or something else wrapped $10.00 or less. May be someone elses treasure, a 50/50 pot and other prizes.